My name is Mark Kemps (aka Rat Bones) and this is my story of how I ended up at the Eersel model boat meeting in the Netherlands. I am a Kiwi living in London with my wife Lucy and son Connor aged 2. I got married on the the 10th of April 2010 … invited to Eersel on the 16-19th April 2010. My very understanding wife allowed me to go on honeymoon without her … what a girl! I took my Kiwi friend Marcus with me as he was in London to attend my wedding. 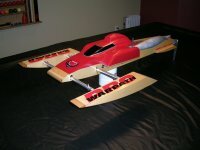 I have been running gas hydros for a while now and decided to join a few of the forums on the web. I put up a post on the Dutch website XtremeRCboats.com to say hello and was invited by Andre Abtmeyer to join them all at a fun event at Eersel in Holland. It was a great opportunity for me to go boating with guys from another country but as I was getting married the week before I told Andre that I probably wouldn't be able to make it but that I'd give it a try anyway. After a bit of a chat with my Lucy she decided that it was too good an opportunity to miss and that I had to go, for that I thank her and know I have made the right choice (of wife I mean!). I then told Andre that I would love to come over and had been given a pass for the weekend and he gave me all the info I needed to book my stay at the campsite and I was assured by some of the other guys on the website that I wouldn't regret it. How right they were! Marcus and I loaded up the car with all my tools and my Lakeracer sport hydro and my Insane Thunderboat and set off early on the two hour drive to Dover ferry terminal. Crossing only took just over an hour and we soon found ourselves driving on the wrong side of the road or the right side depending on which way you look at it, through France. It was a beautiful sunny day as we soon left France and entered Belgium. The roads in Europe are very well maintained and easy to navigate, however, we still managed to get completely lost in Antwerpen city somehow and after a few extra miles and a bit of unscheduled sightseeing we found our way back on track and soon entered Holland. After a four hour drive we arrived at the campsite Ter Spegelt and felt very happy as it was an amazing venue and had a very relaxed feel to the place. We had booked into a caravan there and when we saw it we were blown away by how nice it was. It looked as if it had just come out of the factory and was very plush and even had a flash coffee machine in it. After settling in we decided to go for a bit of a look around and went to have a look at the lake we would be running on to see if we could find any of the other boaters that would be there. The lake was in a beautiful setting and we knew that this was going to be a great few days. We soon found a few guys and were immediately introduced to Andre who had invited us and were impressed by his welcoming nature and happy smiley face. After meeting a few of the other guys and explaining that I was from New Zealand (but that I hadn't driven from NZ), we made our way back to the caravan, about 100 metres from the lake's edge and had a couple of beers and got the boats ready for the next day. We then went down to visit with Nils and Rene and a few of the other lads who had a bit of a bar set up outside their caravan and as it was my honeymoon we opened a bottle of champagne and had a few drinks with them. After meeting them all we decided it was best to head back to the caravan before we got too wobbly. We made a quick visit where Andre and Marc were staying in a similar caravan with a couple of other guys and immediately saw a boat on the table with its engine in bits and parts spread all over the place. The guys showed me some really nice chromoly props that a guy in Aussie makes which are as hard as heck and super sharp with an edge that never dulls. I headed off to bed looking forward to the three days of boating ahead. The next morning I was up early and sorting out the boats and getting all my bits of kit ready to run. We arrived down at the lakeside and immediately knew this was something very cool indeed, the bits of kit that were there were just amazing and some very nicely built boats were coming out of cars, vans and very flash looking trailers. I met up with the guys in the transmitter tent and Marc (Big Daddy) took me aside and explained how they would be running the event and that safety was the main priority and I signed my transmitter in. They had instructions on a whiteboard in Dutch and German and ended up putting an extra bit on “for you Kiwis” in English just for our benefit. The day was split into three lots of open water for anything to run and then had separate times for electrics, tunnels, hydros and in the afternoon a demo section where the very big and flash twin engine cats and other big boats could run. The rescue boat was manned by two guys at all times and had a frame on it where you could fit perhaps four big boats and also had a siren so that we were aware of its presence on the water. When the first boats started to run that day Marcus had a massive smile on his face as he had never seen a boat run before and it didn't leave his face for most of that first day. Soon it was time for me to have a run with my Lakeracer Extreme sport hydro and as this was the first hull outside New Zealand, where they are made, I was keen to have a good run with it. Marc introduced me over the loudspeaker and although I didn't understand what he was saying I heard New Zealand and hydroplane and knew that was me. I had put a propshop 6719 on that I hadn't run before on the boat but had won the Nationals with in NZ on another hull and chucked it in. It immediately took off and I started to run the course keeping as tight as I dared to the buoys it was doing probably about 105 kph and was running ok but I had had much faster runs before and learned straight away that this was not the time for testing and just to run the prop that I know works the best. I was a bit loud at around 90 decibels so I only did about five laps but was running pretty well, and then I hit the buoy on the last lap and the boat flew through the air about 10 metres and landed and carried on as though nothing had happened so brought it in to a round of applause which was just awesome. I had a few more runs that day and borrowed Nils' stinger exhaust for my pipe which brought me down to 82 decibels with no apparent power-loss and I must thank you Nils for letting me pinch that off you for the rest of the weekend. Marcus did a great job that day of taking the video since he had never seen boats run or the camera before that day and I must thank him for his efforts. After watching all the other guys run their boats in the sunshine and visiting some of the vendors there, we headed back to the caravan to get cleaned up and then went back to Nils' and Rene's place and had a great feed with them and got on the beers again. Wonderful guys and we had a great night talking rubbish. The next morning I was up early again and felt great which surprised me but am sure it is because I knew it was gonna be a great day. The sun was out already and the air was still but crisp. I took my boats down to the lakeside and am sure there were more boats that day than had been the day before. Some amazing bits of kit were coming out... twin engine cats, 4-engine boats and an amazing twin turbine cat that left most who saw it a bit speechless. I had gone back to my trusted prop on the Lakeracer Extreme and had a few really good runs and was probably up around 110-115 kph when all of a sudden I had no throttle control and the boat was on full throttle, I had steering and so just started to run the laps and tried to flip it by giving it full left turn, but this hull takes that no worries so couldn't manage it. Eventually I managed to put it over and heard a sudden stop as it was still in the air and knew something was definitely not right in the engine department. It turned out that the rod that holds the butterfly on the carb had broken in half and the butterfly had gone down between the piston and liner on my Quickdraw. When I saw that I thought oh well I've killed it, never mind and it was locked solid. I had a bit of a think and looked in there and backed the motor up while I prised the butterfly out with a screwdriver and when I took it all to bits the piston had taken all the damage and the liner was not damaged in any way, not even a scratch, which was amazing. After a bit of tinkering and some bits off Powerpete, new piston, ring and pin and a new venturi carb it was ready to run again and went better than it's gone for a while which was very lucky considering I had thought it was dead. Had some really good runs after that and boat was smoking quick which was very cool and then had a little glitch in radio and put it into the bank at about 40 kph, and I heard a few gasps but knew that there would be no damage as my hydro is very well made and super strong. Sure enough not a scratch. Just covered in reeds and mud which was actually quite funny. I changed the battery in the radio and went out again but was still having a few radio problems and the failsafe cut in but didn't kill engine completely and ended up on idle doing small circles in the middle of the lake. The guys in the rescue boat managed to lasso it and drag it into the boat after it had drenched them, which I must apologize for, but must say looked very funny. Was an awesome day's boating and the most fun I've had at the lake in a long time. Later that evening we had a buffet dinner in the restaurant and I sat with Andre and his wife and son and after a very nice feed they started the raffle which had some amazing prizes due to Andre's hard work and of course all the guys that had donated different prizes. It took two hours to complete and as I couldn't understand what numbers Marc was calling out Andre's wife was a great help in translating for me. After about an hour and a half I popped outside for a bit and the next thing I heard was ”where is the Kiwi?”and I came back in to find out that I had just won a prop balancer which was very cool and a great end to a wonderful evening, so thank you all for that. That next morning I was a bit slow but still keen to get out there and after checking my radio and charging batteries I did a range check by walking down to the shops and everything seemed to be ok. I took both boats down to the lake and took things slow as it was a very hot day and I was a bit tired from the night before. The first run went really well and boat was really flying when all of a sudden the same thing happened and here I was going round slowly in circles again, this time Marc was in the rescue boat and got completely drenched roping it in for which I'm sorry again but must say that he had very good cowboy skills for not living in the wild west. I decided not to run the sport hydro again that day as losing radio twice was enough and needed to fix the problem properly and check the receiver out. I had a few runs with my thunderboat after that and it was really flying, literally, as my fin came loose on a corner and it flew through the air for about 30 feet. But no damage and when I got it back on the water it was performing really well and I had a lot of fun running with Andre and Mark's Whiplashes and ran a few times until I eventually broke a shaft. Later that day Andre came up to me and said “Mark I have a present for you” and he gave me two sets of very high quality hex keys that were very short on one end, just perfect for working on the Quickdraw and I was very humbled and pleased with them and didn't know what to say for a while. It just goes to show what sort of people they were there and without them it wouldn't have been such an amazing trip. That afternoon the twin turbine went for a run and the sound it made was nothing short of incredible - what an amazing boat and the workmanship was just immaculate as was the same with the twin engine cats that did a demo all together that afternoon. Later that afternoon I was feeling a bit slow for sure as I hadn't drunk enough water so went for a quick lie down and tried to rehydrate when I sat bolt upright as I realised I still had Nils' exhaust and he wouldn't be able to run without it, so I ran down and gave it back to him and said sorry for being such a plonker. He was great and without his generosity I wouldn't have been able to enjoy running my boat there. Andre also introduced me to a guy called Isam who makes an electronic unit that will cut out the engine spark if your battery goes flat or if you lose radio contact but the best bit is that he also makes one called a speedtool with an engine tach and GPS all in one, which is a very cool bit of kit and I have ordered one from him and am sure a lot of guys will want to know about them from reading this, if you contact me through MGB I can send you his details. After the clean-up that afternoon a lot of the guys started to head home and we said goodbye to all the friends we had made there and finally said goodbye to Andre and promised to try and come to the next big meeting in Heilbronn in Germany in August. As we weren't leaving until the next day we were invited by one of the vendors “Powerpete” to a barbecue by the lake that evening and had a great time again that night talking about the hobby we all love and eating some wonderful food, so thanks for that Pete. The next morning we found ourselves up quite early and packed the car and hit the road. On the drive back to London, we made good time and managed to take a wrong turn just after Antwerpen this time as my GPS went a bit crazy for a bit, but were soon back on track. The ferry back to England was very busy due to the fact that no planes were in the sky because of the ash in the air but we had no problems and were soon back on the right side of the road or left if you know what I mean and home in no time. My little boy Connor went crazy when I got back and wouldn't let go of my leg for a while so I took my boats out of the car and put one in the bath, gave him a brush and some dishwashing liquid and told him to go for it, and at two years old he actually did quite a good job! Also would like to thank Mike Dean from Lakeracer Boats in New Zealand for making such an awesome hydro and making me part of team Lakeracer. I can't wait to start running his new rigger and winning some races. Lastly, thanks to my new wife Lucy who has accepted that she is married to me and the boats! Didn't see this article yet ! Great piece you wrote here Mark. The lakeracer hydro really did great and will be seen more and more on the international waters. Just read the article! Great write-up! We sure had fun and i hope you and Markus enjoyed your stay with us. It was a pleasure having you over. Hope to see you guys in Heilbronn this year. Very hospitable and nice area. Looks like you had an awesome weekend Mark. 90db? you would get shot over here running that loud. Definatley some nice boats over that side of the world. Thanks Mark for the article. It was great to have you at the meeting. It was one of the best fun runs we ever had. Good weather (only cold nights, brrrr), good food and drinks, many boaters and boats, all kind of power on the water (electric, nitro gas and turbines) and an excellent location (huge campground with cabins for rent, restaurant, huge enclosed pool and many playgrounds for the kids). Special thanks to Mark Kemps for writing and submitting this article...looks like an awesome time!! !